How to clean out your closet? February 17, 2018 / admin / Comments Off on How to clean out your closet? If you aim to create a wardrobe that is stylish, clean and organized, here are simple steps that will get your closet ready. What to keep – Your wardrobe basics like your best winter jacket, favorite blazer, and high-quality staples should be stay. You should also preserve a good quality LBD that fits well for special occasions. Carefully look at your on-trend items an assess if they have been worn in the last year and place things that have not been worn for a while on to one pile. Say goodbye to – If you have items that still have tags on for over six months, look at donating them or selling them online. The other items that should go are clothing that looks worn out or discolored. Clothing which is ill-fitting should also be added to your donate pile. Get organized – Start organizing your closet by buying slim, nonslip hangers that will hold your tops, coats, and bottoms. You should then arrange everything so that it faces one direction to save you space and to give you a better idea of what you have. Then look at categorizing your items according to type like tops by sleeve length, skirts, shorts, pants, dresses, and warm clothes. Then sort your wardrobe by color, light to dark. 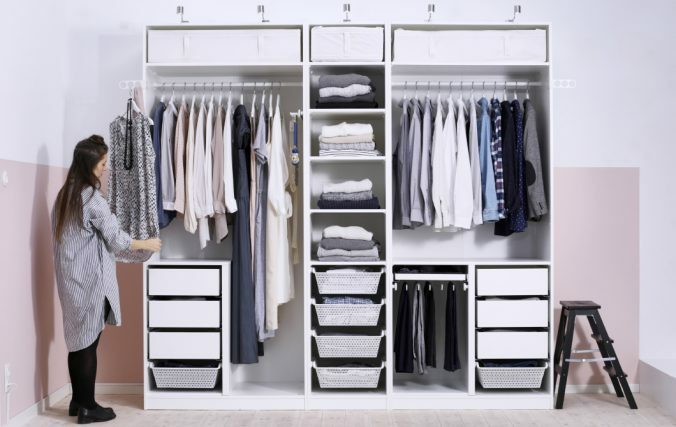 Look at only hanging items that you will wear within a season and pack everything else in storage bins by season. Make the most of the closet space you have, by adding cubbies or hooks.